Moving to a new location can be stressful and complicated. 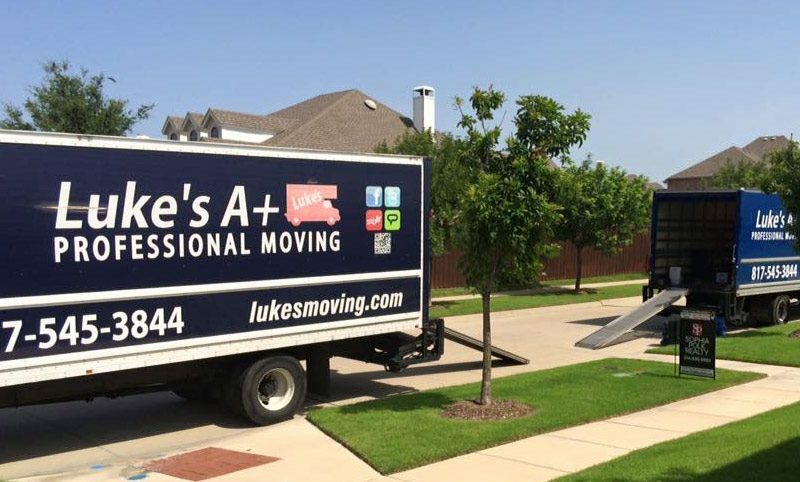 But at Luke’s A+ Moving Services, we have the right formula to assure our clients a stress-free move. Our family-owned and operated company combines experience and the most effective moving practices to provide exceptional services. Our strong dedication to provide excellent moving services sets us apart from our competition. Our expert packers and movers take great care with your valuables, using the most appropriate packing material for every item. In a hurry? No problem. We schedule each move to fit your schedule. We accept same day moves at a reasonable rate to make sure we are offering the best in customer satisfaction. We have well-maintained moving equipment and some of the largest moving trucks in the Dallas Fort Worth Metroplex. Contact our full-service moving company in Colleyville to prepare for your upcoming move. Your successful move depends on the people you trust to take you to your destination. Luke’s A+ Professional Moving knows all the things needed for a convenient move. You can never go wrong if you hire a professional moving company. We’ll move you within Colleyville or to any part of Texas. Colleyville is a city within the Dallas/Fort Worth Metroplex. It nestles roughly 3.5 miles west of the DFW airport, in the northeast region of Tarrant County. Public schools, public safety, wealth, and rural atmosphere make Colleyville the ideal place to call home. Colleyville is one of the safest neighborhoods in the DFW area. Public safety is taken very seriously and the police station, fire department, and emergency personnel keep the city safe through extensive training and high quality equipment. Wealth and a rural atmosphere make this city an interesting blend of historical roots and status. The average cost of a home in Colleyville is $750,000. With so many people moving to the metroplex every day, the house value continues to rise, making Colleyville not only a great neighborhood to live but a great return on your investment. Grapevine-Colleyville ISD (GCISD) is a highly rated school district. Both Colleyville High School and Grapevine High School were rated in the Top 100 Schools in Texas in 2 different publications. GCISD Board of Trustees was named the 2018 Outstanding School Board of the year, honoring the school board by their demonstration of commitment to their students and communities. Colleyville was originally named Bransford, but in 1880, Dr Lilburn Howard Colley settled here. This prominent physician and veteran of the Union Army made such a huge impact that the community renamed the city Colleyville in honor of him and his influential achievements.